This cookie dough is conveniently made in a food processor, just as you might make pastry dough. The stars have a delicate crunch and lovely earthy-nutty flavor from toasted walnuts. (Using toasted nuts is important, so don’t skip this step!) The chocolate drizzle is icing on the cake…I mean cookie. These walnut cookies may be billed as holiday fare, but we say break loose from tradition. Every day could use a little stardust. 2. Spread the walnuts in a single layer on a small baking sheet. Toast in the oven for about 8 minutes or just until you start to smell them. Remove from the oven, transfer to a plate, and let cool to room temperature, about 15 minutes. Turn off the oven. 3. Pulse the cooled, toasted walnuts and the granulated sugar in a food processor until the nuts are finely chopped but not finely ground. Transfer the mixture to a small bowl. 4. Add the flour, confectioners’ sugar, baking powder, and salt to the food processor. Pulse once to combine. Add the butter and pulse a few times until it’s chopped into tiny bits. Add the walnut mixture and pulse twice to combine. Add the egg yolk, vanilla, and 1 tablespoon of water and process just until the dough feels moist when pinched. It may be necessary, in order to form a cohesive dough, to add 1/2 to 1 1/2 tablespoons more water, as needed, and pulse a few more times until the dough just starts to clump together. 5. Turn the dough out onto a sheet of plastic wrap and gather into a ball. Press into a disk shape, wrap in plastic, and refrigerate until firm enough to roll out, at least 1 hour. 6. Preheat the oven to 350°F (175°C). Line a cookie sheet with parchment paper. 7. Roll out the dough on a lightly floured surface to a 1/4-inch thickness. 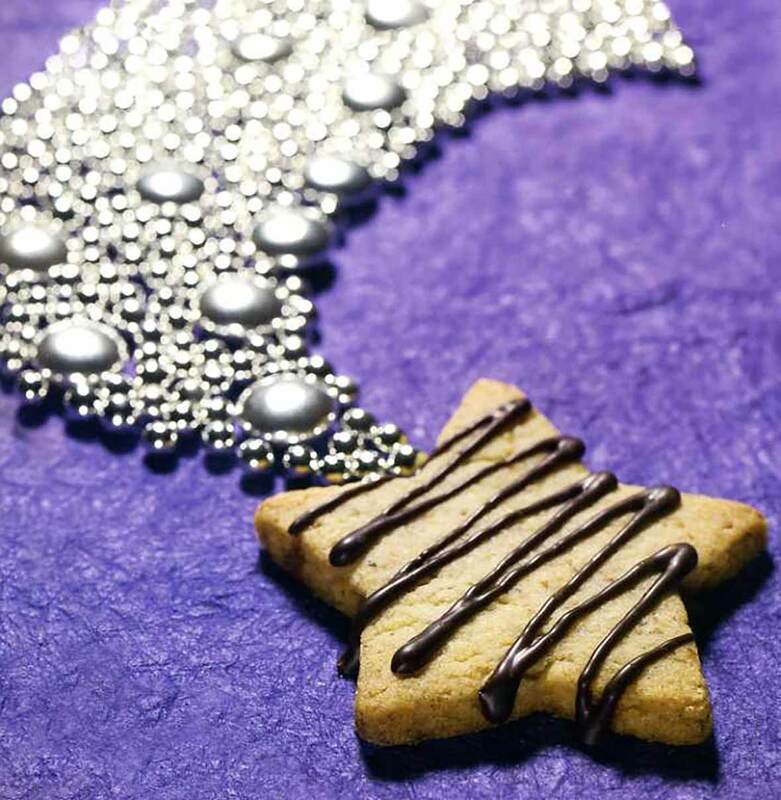 Use star cutters to stamp out cookies, arranging them about 1 1/2 inches apart on the prepared sheet. Re-roll the scraps. Bake the cookies for 8 to 12 minutes or until light golden. The cookies are fragile when warm so let them cool on the baking sheet for at least 5 minutes before transferring to a wire rack to cool completely. 8. Melt the chocolate in a microwave-safe glass measuring cup or bowl in the microwave in several 20- to 30-second bursts on medium power, stirring after each interval, until melted and smooth. It may take as many as 6 bursts in the microwave to melt the chocolate. Let cool at room temperature for a few minutes. 9. Place the cookies close together, but not touching, on racks set over wax paper. Pour the chocolate into a small plastic bag or squeeze bottle. If using a bag, seal it and make a tiny cut in one corner. Working quickly, drizzle the chocolate in a zigzag pattern to make diagonal lines over the stars. Let the chocolate set completely before storing the cookies. 10. Store, layered between sheets of wax paper, in an airtight container for up to 1 week. These are a really nice and buttery, nutty cookie with a lovely crunch and a chewy texture from the walnuts. The dark chocolate is a wonderful finishing touch. 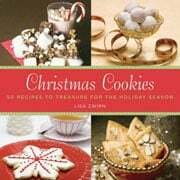 Perfect with an afternoon cup of tea and a great addition to your holiday baking. I could have used a bit more chocolate to cover all the cookies. I had eight left without the chocolate but that's perfect for my husband as he prefers his cookies plain. What lovely cookies! Delicate, buttery, and rich. The dough came together in a snap, rolled out easily, and the cut-out cookies held their shapes well. I made 2 dozen little Christmas trees (cutter measured 2 1/2 inches across the base and 4 inches tall) and drizzled them with dark chocolate and then another 3 dozen tiny stars (cutter measured 1 1/2 inches at widest point) and drizzled those with white chocolate. They look super cute on the platter together and this way people have a choice of having "just a taste" if that is all they think they want (although I can't imagine anyone will stop after just one! ).The trees were baked at 10 min, the little stars only took 8 min. Watch the bottoms though—they go from barely golden to almost overdone in about 30 seconds. The recipe worked perfectly! I did not need to add any additional water and the dough rolled out like a dream. I was expecting them to be similar to the other nut-based, one-bowl cookies I make—I know them as Mexican Wedding cakes but they go by many different names—but these are quite different in taste, texture, and appearance. A nice new addition to holiday cookie trays. Walnut Star Cookies Recipe © 2008 Lisa Zwirn. Photo © 2008 Corinne Planche. All rights reserved. All recipes and photos used with permission of the publisher.